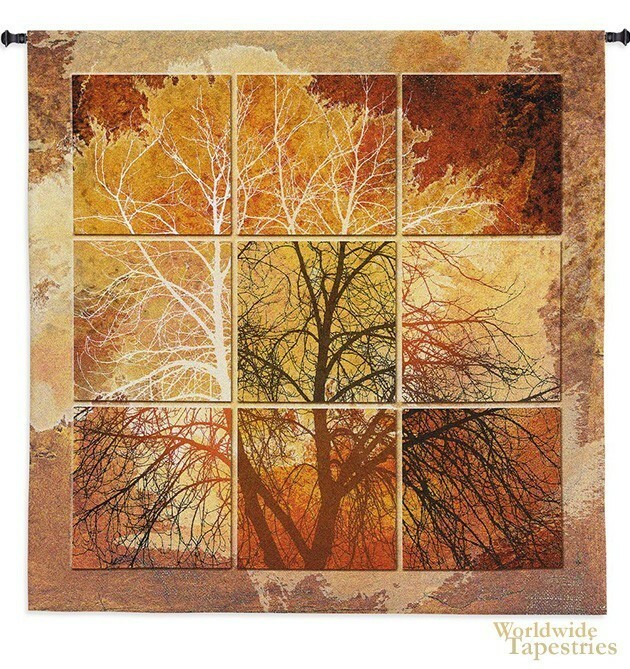 In this contemporary tapestry "October Light" we see an abstract scene of autumn represented by a tree in various light. In this tapestry we see an interplay of light and color to represent the ever changing conditions of one of the most dramatic times of the year. Reds, browns and orange are the main colors here and the branches of the tree are seen to great effect in this piece. Filled with bold color and form, this modern piece is a reflective look at this most beautiful of seasons. This contemporary tapestry "October Light" is backed with a lining and has a tunnel for easy hanging. Note: tapestry rod and tassels, where pictured, are purchased separately. Dimensions: W 52" x H 55"